ITOGON Mayor Victorio Palangdan wants Benguet Corporation’s operations temporarily suspended. Palangdan is seeking for the issuance of an order for temporary suspension of the operation of the Benguet Corporation and its contractor ACMP Contractors in Itogon, Benguet from the Mines and Geosciences Bureau-CAR. In a letter dated March 5, 2015, the mayor raised the threats of danger brought about by Benguet Corp.‘s Tailings Storage Facility No. MANILA, Philippines – The Mines and Geosciences Bureau (MGB) has suspended the nickel mining operations of 4 mining firms in Central Luzon because of unsystematic methods. Suspended were Zambales Diversified Metals Corporation, Benguet Corporation Nickel Mines Inc., Eramen Minerals Inc., and LNL Archipelago Minerals Inc.
ITOGON Mayor Oscar Camantiles foresees a marriage between mining and tourism in his town. Camantiles championed the Benguet Corporation example, which has mined the area for decades and crafted the unique Balatoc underground mine tour, a first in the country. The mine tour is one of the most successful tourism come-ons of the municipality and utilizes the abandoned areas of the mining company, in a bid to preserve employment, culture and to familiarize the public to life inside the mines. ITOGON, Benguet — Officials disapproved Benguet Corporation’s opposition on applications for free patent titles of the indigenous peoples (IPs) of the municipality. Legislative council’s presiding officer, Vice Mayor Noel Ngolob, said Benguet Corporation’s opposition has no basis. Councilor Gerard Cornel said the claim of the IPs, who are mostly senior citizens, is valid. Mayor Oscar Camantiles also said the claim of the IPs has basis. Ilaban ti Daga, Biag ken Karbengan! Fight for Our Land, Life and Rights! We mark Cordillera Day 2012 with a rallying call to fight for our ancestral lands, our lives and human rights through a week of protest activities and celebrations of indigenous peoples’ struggles in Apayao, Abra, Benguet, Kalinga, Ifugao, the Mountain Province and Baguio City. On this 28th Cordillera Day, let our protests echo with renewed vigor and commitment to defend our ancestral lands against development aggression. Let us strengthen and sustain our protests in the communities, town centers and urban areas. More than 10 years ago, a massive sinking, landslide and ground subsidence occurred in Colalo, Mankayan, where Lepanto Mining has operated for more than 70 years. On that fateful day of July 26, a large portion of More than 10 years ago, a massive sinking, landslide and ground subsidence occurred in Colalo proper, More than 10 years ago, a massive sinking, landslide and ground subsidence occurred in Colalo, Mankayan, where Lepanto Mining has operated for more than 70 years. More than 10 years ago, a massive sinking, landslide and ground subsidence occurred in Colalo, Mankayan, where Lepanto Mining has operated for more than 70 years. On that fateful day of July 26, a large portion of Colalo Proper above the quarry site sunk and eroded, totally damaging the elementary school, four homes, a portion of the road, several farms and orchards and other improvements. The sinking affected at least 10 hectares of land. Local resident Pablo Gomez, 36 years old, married and with five children, was buried alive while transporting school facilities to higher ground. 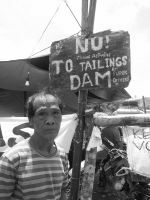 MANILA, Philippines – A mining agency has denied a mining claim of Benguet Corporation in the Cordillera province due to failure in getting consent of indigenous residents on time. The Romualdez-led mining company informed the stock exchange and the Securities and Exchange Regulator on Tuesday that a Mining and Geosciences Bureau’s office, the Cordillera Administrative Region (MGB-CAR), has denied Benguet Corp.‘s mining claim applications in the municipality of Itogon in Benguet Province. MANILA —- Using picks, shovels and bare hands, rescuers and volunteers searched Sunday for bodies buried by dozens of landslides in the Philippines, as the country struggled to recover from successive typhoons that have killed more than 600 people. Filipino police tried to unearth landslide victims at a devastated area in the town of La Trinidad, Philippines, on Sunday. The exact number of casualties from the landslides and the floods caused by the last typhoon, Parma, was hard to determine. The National Disaster Coordinating Council reported a countrywide death toll of 193 from Parma. Far from a counter-insurgency operation, the massive militarization and dislocation of communities in Surigao del Sur and the Caraga region had more to do with protecting business interests, primarily mining and energy investments.